The IC 12 is Intova’s 12 megapixel digital camera. 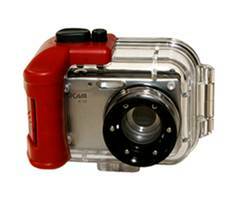 Featuring a 1/2000th second shutter speed and new, enhanced Digital Signal Processor, this model is ideal for capturing fast moving subjects underwater. Other camera features include 3X Optical Zoom/6x Digital Zoom, 2.4” LCD and Lithium ion battery that does not require removal for recharging via USB cable. The sleek external housing is waterproof to 180 feet/54 meters and incorporates a molded hand grip with action-ease shutter button. Dual O-rings provide extra leak protection and the 46 mm lens barrel thread allows addition of filters and wide angle lenses.